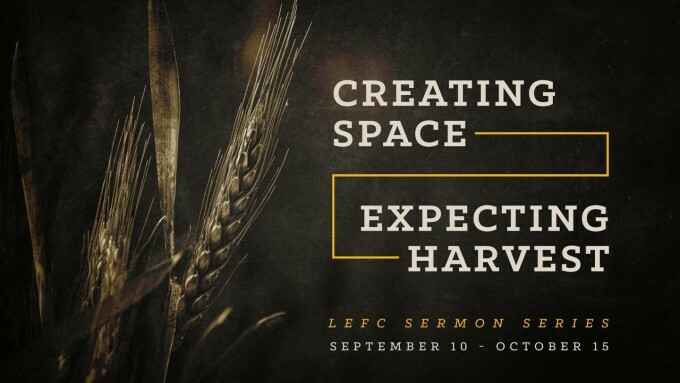 Creating Space, Expecting Harvest ..."Vision Leads"
If mission is what we do outside of the church in Jesus’ name, then we have an amazing opportunity to love people. This is the “go” in MA 28:19! Clearly, mission (making disciples and loving on people) is Jesus’ command. So, why can it be such a challenge for many of us to demonstrate our love and help those who are in need? What are some reasons/excuses we use to NOT engage others and make disciples? Look at MA 25:31-46. What examples of love did Jesus mention? How do those translate to us today? How is God moving you out of your comfort zone to do a better job of loving others? How will this commitment to Jesus’ vision affect both you and your LITE6/ Life Group? If we want to know Jesus’ heart of love, we must first be captivated by Him. What have we done since last week to make sure this is happening? (Look again at last week’s topic, ”Why I Love Jesus”.) Prayer is one key to getting close to the heart of God. Discuss how we can develop a deeper love for Christ, individually and as a Life Group. Spend some significant time in prayer as a group asking God to reveal his love so we can love others better. Telling our stories is always a great way to begin to develop community. If you want to discover someone’s passion, listen to their story. Instead of telling your entire story, allow group members to briefly summarize their journey to Jesus. Especially include what or who attracted you to Him, how you’ve grown in Him, how you’ve struggled in your relationship with Christ. Now, ask yourself how your present passion for Christ affects others. RE 2:4 describes walking away from Jesus as “…a Lucifer fall.” (Message version)! Believing the enemy’s lies always negatively affects our love for Him as we walk away from His leadership in personal independence or What are the lies (good or bad) you are believing about yourself? What is the truth about who we are in Christ? JN 8:32 How can we help each other? If I am not captivated by Christ anymore, how do I renew my love for Him once again? Do a 180. Recover your “dear early love” (Message) according to RE 2:5. Prayerfully allow His Spirit to speak to your heart about what, in your life, needs to go so you can become fully captivated by Christ again. Try spending more time reading God’s love letters to you (Bible). This should make for good conversation and loving accountability within your Life Group and help renew your love for Jesus.